Baking fish is a simple dry-heat method of cooking, also known as oven roasting. Almost any kind of fish can be used when baking. And there are several different baking methods and techniques that can be used as well. The heat source is radiated from the oven walls and transferred throughout the air of the oven. It is important to be aware of the temperatures and times when baking fish. Begin checking on the fish when you think that it may be half way finished cooking. One thing to remain aware of is that it can be easy to overcook your fish. Overcooking it will dry out the fish, and no matter how much liquid you use, you will not be able to save it. And so, when it loses it moisture, it loses its tenderness and becomes tough. That doesn't sound tasty, does it? It should be moist and flaky. It's best to marinate or baste lean fish while cooking it this way. This will help ensure that it will not lose its moisture and dry out. Or you may choose fish higher in fat content. Sauces, stuffings, rice, and vegetables can also be cooked with the fish. Most baked fish dishes are usually enclosed in some way when cooked. This allows the fish to cook in the steam generated from its own juices and with the help of a little extra added liquids or sauces. The liquids should only surround the fish without submerging it, otherwise that is known as poaching fish. So, what kind of fish can be used for baking? When using whole fish, leave the head on whenever possible. The head seals in the juices and holds a lot of meat as well. Besides, the cheeks from the head are referred to as the filet mignon of the fish. 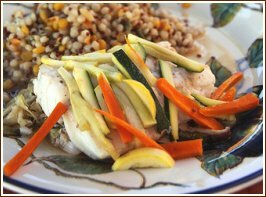 Check out this Sweet 'n Spicy Roasted Whitefish recipe as an example for a whole baked fish. Visit our baking fish methods page for more information on some of the more detailed methods used for baking.